Homepage / Blog about Writing Tips from True Professionals / Who Invented Homework? If you Google “Who invented homework?” you see a series of answers about an Italian teacher who gave homework as a punishment to students. It is listed in tens and maybe hundreds of Google results, so it must be true…right? When you read Google, you are simply reading a rewrite of a rewrite. Roberto Nevilis of Italy (1905) was not the person who invented homework. In fact, nobody really knows who invented homework, but we can use a few historical facts to narrow down our search. 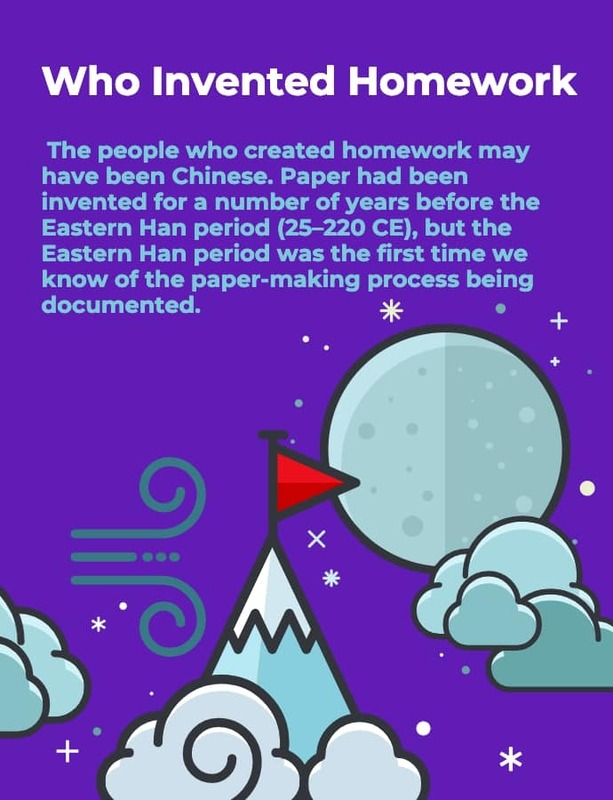 The people who created homework may have been Chinese. Paper had been invented for a number of years before the Eastern Han period (25–220 CE), but the Eastern Han period was the first time we know of the paper-making process being documented. If you think about it, how else could it have been documented if the paper had not been invented yet? We also know from later Chinese history that wealthy families would teach their sons and daughters how to read and write at home, which is technically homework, especially if students were encouraged to practice on their own. In recorded history, we know that Pliny the Younger used to tell his students to practice their oral work at home. Pliny was a teacher on the oratory in ancient Rome around the first century AD. Books and writing materials were always expensive because it is difficult to make paper, and any substitutes would typically have a short life. Plus, paper substitutes would require so much effort that using them to teach children was impractical. It was only in 1799, that paper suddenly started to drop dramatically in price thanks to Louis-Nicolas Robert of Essonnes, France, as he was granted a patent for a continuous papermaking machine. Books were still expensive and were still prized, but they were suddenly cheap enough for middle-class people to afford. In terms of who created homework, it is fair to say that Nicholas played a part in what modern people would call homework. In terms of who invented homework, you could say that wealthy families in the UK (United Kingdom) invented modern versions of homework. Paper became cheaper, books became cheaper, and more and more children were attending school. In addition, the United Kingdom had spread western culture all around the world, including spreading over to what we now call the United States. Children would attend school and wealthy parents could afford the materials and tutors required to have children learn at home. Wealthy children from around the world were taught in classrooms and at home, and thanks to the availability of books, homework was a possible and viable way of teaching children. When Was Homework Invented for Practical Class Subjects? In essence, any subject that can be taught at home was probably taught at home throughout our history. From the cave dwellers teaching their kids how to light a fire to the wealthy children in Europe who learned the piano at home. The people who created homework for practical subjects may have been teaching children since the dawn of humankind. Think about it, you may have a home-economics/cookery/food-tech lesson at school and then take homework home, and yet mothers have been teaching their daughters how to cook at home for thousands of years. If you ask the government when was homework invented, they may say 1988. The UK was the first country in the world to introduce a blanket national curriculum. For the first time, a country had specified what all of its children must learn. Before the first national curriculum, there were students around the world who had never done any homework. The schools, colleges, professors, and teachers were the ones who decided if students did homework. In 1988, it was the first time that an entire country had followed a specific teaching scheme, and it guaranteed that every student who attended school must do homework. When students ask when was homework invented, they usually mean the essays and reading they have to do at home, and if that is the case, then 1988 was when homework was invented. The type of homework you are used to doing these days was pioneered in 1988. People may have been working from home before that, but the type of homework you receive wasn’t standardized (or even all that common) before 1988. Some people say that Margaret Thatcher invented homework because she instituted the world’s first national curriculum. It wasn’t the first time a leader had told a country what it can and cannot teach students, but it was the first time it was standardized in a way that determined what “Should” be taught rather than what “Cannot” be taught. Previous to 1988, other countries would mandate what cannot be taught without a thought to what should be taught. It is one of those odd facts about homework because if Margret Thatcher had not brought people from the working class up to middle class, then most people couldn’t have afforded to have their children learn things from home, which would have meant homework would have only been reserved for richer families. In addition, since the introduction of the national curriculum and mandated homework, test scores have continued to rise in countries with a national curriculum, which has led to criticisms that maybe exams are getting too easy. Did you know that over 70% of students admit to using assignment writing services at least once during higher education, and those are only the students silly enough to admit it? If you have a homework deadline looming, then contact Paper Writing Pro Service, allow their writers to do your homework for you, and then hand it in as your own. There is no way anybody can ever know you didn’t write it yourself unless you are silly enough to tell people. Next How to Cite a Case Study?